“We feel like we’re a good basketball team despite what people are talking about,” Williams said. “This was a gritty win,” Los Angeles coach Doc Rivers said. 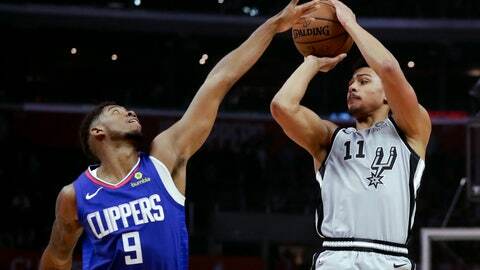 The Spurs were the third high-powered team in a row beaten by the Clippers, who edged Milwaukee and defending NBA champion Golden State in a pair of overtime wins. Williams proved the difference in those games, too. He scored the final 10 points in overtime against the Warriors after the Clippers blew a 14-point lead in the fourth. His layup with 0.3 seconds left in overtime beat the Bucks. Williams led Los Angeles with 23 points off the bench, hitting two free throws to seal the win. Danilo Gallinari added 19 points, including four straight late free throws, and Tobias Harris 18. DeRozan scored 34 points for the Spurs, who dropped their third in a row. Rudy Gay added 19 points off the bench. The Spurs tied it up 107-all on a pair of free throws by LaMarcus Aldridge, who had 16 rebounds. Williams tried to get Bryn Forbes in the air with a pump-fake and let fly a 3, having missed his two other attempts in the game. DeRozan scored on a drive to get the Spurs to 110-109, but they got no closer. Montrezl Harrell scored the Clippers’ first six points of the fourth to get them back to a double-digit lead, 96-86. DeRozan missed two free throws before Patty Mills and Marco Belinelli hit back-to-back 3-pointers that closed the Spurs to 96-94. San Antonio got within one early in the third on basket by DeRozan. He twice scored to put them within two. But every time the Clippers answered to stay ahead, with their second unit scoring 10 of their final 12 points for a 91-84 lead after three. The Clippers opened the second quarter with a 15-2 run that produced their largest lead of 44-30. Harrell scored seven in a row. The Spurs answered with a 23-8 spurt, including 10 by DeRozan, to erase their 14-point deficit and give them a 53-52 lead. The Clippers got a pair of free throws by Gallinari to lead 61-60 going into halftime. Spurs: They fell to 2-5 on the road. … They were outrebounded 50-45. … F-C Pau Gasol missed his fifth straight game with a sore left foot. Clippers: Harris has at least 15 points in a career-best 14 straight games. … They improved to 5-1 in their last six games at home against the Spurs. Shai Gilgeous-Alexander got in foul trouble for the first time this season with three in the first half. Rivers kept him on the floor after he got his fourth and the rookie didn’t get another. Gilgeous-Alexander finished with nine points and five rebounds. He came up with a big jumper when the Clippers were clinging to a one-point lead in the fourth. “I believe I am one of the underrated players in the league.” — Harris after hearing TNT commentator Charles Barkley described him that way. Spurs: Host Golden State on Sunday. Clippers: At Brooklyn on Saturday to start a three-game Eastern swing.